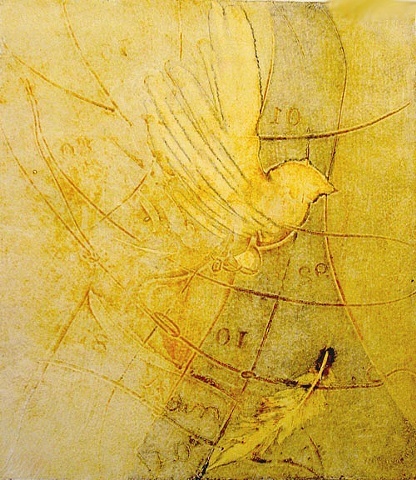 A collograph is a collage printing technique that is a cross between a relief plate and an intaglio plate. There are two types of collagraph printmaking: subtractive and additive. Both versions of collagraph printing allow for a lot of creativity and innovation. In these particular collographs I added gesso and a feather to the plate, incised marks and numbers into it, let it dry, added inks, and ran it through the press.